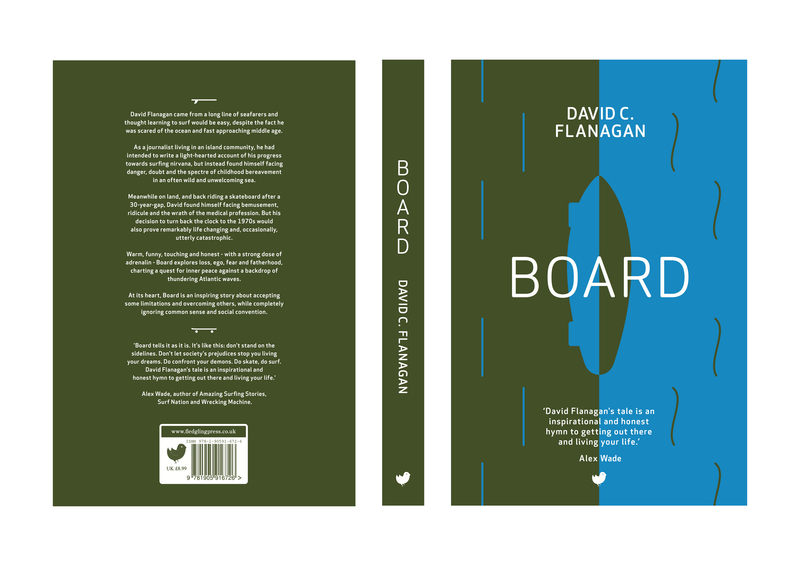 My first book, Board, was published in March 2015 by Edinburgh based Fledgling Press Ltd.
Board is the story of my attempt to overcome a lifelong fear of the ocean – despite my coming from a family of seafarers – and learn to surf as a 40–something father. The book charts my first tentative, and hapless, steps in surfing and the challenges and danger I’ve subsequently faced trying to pursue this most demanding of sports off the wild Atlantic coast of my home in Orkney. As a journalist, my original intention had been to write a light-hearted account of my progress. While Board certainly isn’t short on laughs, writing the book forced me to explore issues such as loss, ego, fear, honesty, fatherhood and friendship. It wasn’t always a comfortable process. I am, as the book reveals, a very average surfer terrified by many of the situations I’ve found myself in at sea. At its heart though, Board is a story of about accepting some limitations – both physical and emotional – and overcoming others. Whilst surfing is the central theme of Board, I also incorporated the story of my return to skateboarding after a 30-year gap. My decision to turn back the clock to the 1970s would also prove remarkably life changing and, occasionally, utterly catastrophic. Board was officially launched in the Pier Arts Centre, Orkney, on Friday 20th March, with an additional launch taking place in the George Street, Edinburgh, branch of Waterstones, on Thursday 26th March. “Surfing’s literary canon has a welcome new addition charting the highs and lows of riding Orkney’s waves…Flanagan’s memoir offers a surf story that’s original on two levels: firstly, it puts an unexpected spin on the man-deals-with-mid-life-crisis-by-learning-to-surf cliché by having its protagonist getting to grips with the Sport of Kings in some of the most inhospitable conditions imaginable, namely the board-snapping, bone-crunching reefs of Orkney’s Bay of Skaill; and secondly, it also details the author’s parallel attempts to rekindle his childhood love of skateboarding – a passion which came to a sudden end one Sunday morning in Leith when he accidentally ploughed through a column of veterans attending a Remembrance Day service.”…Roger Cox, The Scotsman. “This is an engaging and brilliantly written surfing and skateboarding memoir. There’s plenty of action, but it’s also packed with humour and reflection, and deserves to reach an audience way beyond enthusiasts for those two sports.”…Scotland Outdoors magazine. “Thoroughly unpretentious, Board brings a brutally honest account of what it’s like to pursue an extreme sport in middle age.”…Andrew Stewart, The Orcadian. Board is available directly from Fledgling Press and online from Waterstones, Foyles Amazon.co.uk, Amazon.com, Amazon.com.au and many other good bookshops. Work is now underway on my second book, though the title remains under wraps for now.